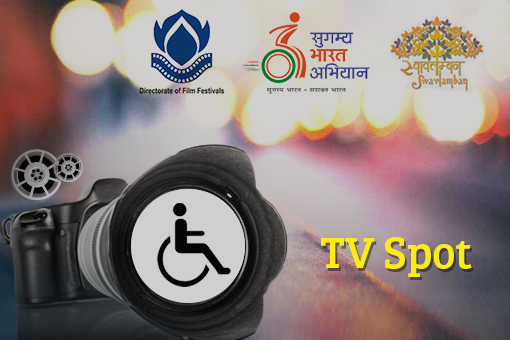 The Department of Empowerment of Persons with Disabilities (Divyangjan) (DEPwD), Ministry of Social Justice & Empowerment, Govt of India is organising 'Short Film Competition on Divyangjan Sashaktikaran 2017 - TV Spots' in association with Directorate of Film Festivals (DFF), Ministry of Information & Broadcasting, Govt. of India. The Competition is being organised in order to create awareness on Accessible India Campaign and to promote various schemes of the Department of Empowerment of Persons with Disabilities (Divyangjan) (DEPwD) among common masses. The Department invites entries from common citizens. The participants may submit their entries shot with any electronic devices in HD format only. The last date of application submission is 8th August, 2017. The ‘TV Spots’ should be based on Accessible India Campaign theme and the duration should not be more than 50 seconds of duration. Winners will be awarded a cash prize of Rs. 5,00,000 and Rs. 3,00,000 for First and Second positions respectively. The participants may download application form along with authorization letter and rules and regulations from links given below. The award function will be held tentatively on 21st September, 2017 at Siri Fort Auditorium, New Delhi.